So, finally - I've started working on my next big project. The Lotr Dwarf project is non-existent as I sold all of these. I simply got bored painting too many similar minis with the same color scheme. 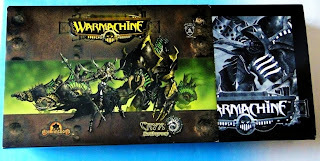 I switched to WARMACHINE and Cryx. It's an interesting army, combining elements of necromancy (zombie- and skeleton-like units) with technology (yup, that's 'jacks). As usually, my choice is mainly motivated by the minis and in case of this army (and generally most of the WM minis), they are fantastic. 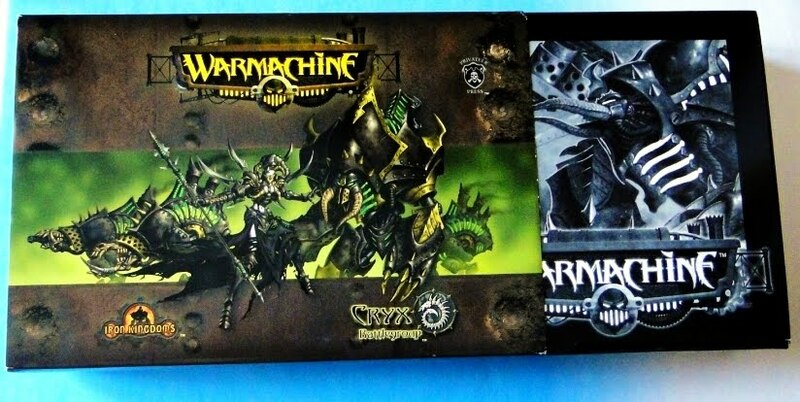 Here's a picture of the Cryx starter box. Nice cover art and really good packaging. Inside the box there are two plastic blister-like smaller boxes. Sweet, that makes sense and the box can be easily converted into a container for painted minis. I've put them together and here's how they look like at the moment. The sculpts are quite unusual. My feeling is that an element of parody is incorporated into the game. Thus, the smaller jacks (known as bonejacks in this army_ are often called chickens and the big one resembles a beetle. Still, I think they look really nice and look forward to painting them. Especially the model of caster - Deneghra, the eve of detail and overall quality of the sculpt is simply great (only the fact that these blades on her back are made from a very soft metal makes it quite difficult to clean from mould lines as they bend, twist and break too easily). I'll begin working on them next week, starting with chickens. I want to work on a color scheme that would be used throughout the whole army. I'll use mainly black, gold, and silver but I'm also thinking about adding some purples (I really enjoy working with these), especially on clothes.